National Institute of Urban Affairs (NIUA), with support from the Ministry of Housing and Urban Affairs, GoI has launched a program for capacity building of 1600 Urban Local Bodies in India on Solid Waste Management (SWM) as part of the Swachh Bharat Mission. 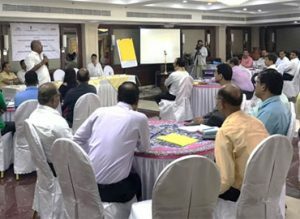 Feedback Foundation, being one of the selected implementation partners, is conducting the first exposure workshop in the series, at Dehradun from 26 th – 28 th September, 2018 covering several Municipal authorities of Uttarakhand. The objective of the workshop is to enable the ULBs to recognize the issues in Solid Waste Management, understand relevant rules and policies and enable effective implementation of solutions prior to Swachh Survekshan 2019. The concepts of ODF, ODF++ and Star rating for Garbage-Free cities are also covered as part of the workshop.